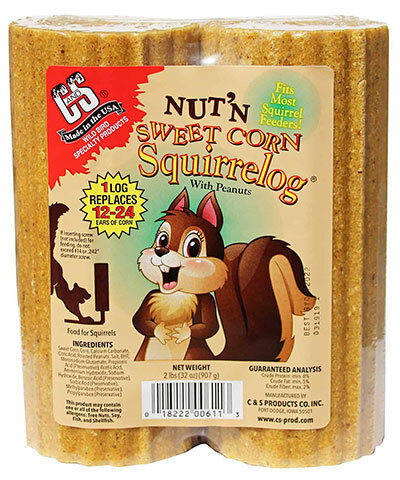 Treat your squirrels to a snack with the C&S Nut'n Sweet Corn Squirrelog. Squirrels will be less likely to pilfer bird seed from your feeders if they have a tantalizing treat established just for them. This cake is composed of sweet corn flour, peanuts, and pecans, so your squirrels will be munching for a long time, forgetting all about your bird seed. Just one C&S Nut'n Sweet Corn Squirrelog replaces 12 to 24 ears of corn, creating a lasting gourmet meal and source of essential nutrients for your squirrels. Note: This case pack includes 12 C&S Nut'n Sweet Corn Squirrelog Two Packs.